CCC reported Wednesday in its free annual “Crash Course” document that while the number of estimates containing a line for diagnostic scanning increased, it still fell far below the 70 percent that OEM position statements alone would dictate. Just 9 percent of estimates prepared using CCC contained a line item for what the information provider described as “’scan/diagnosis/health check/astech,’” up from 4 percent in 2016. The average charge was $90, down from $149 in 2016. Position statements from Honda, Subaru, Nissan, General Motors, FCA, Mercedes and Toyota clearly state scanning needs to be done at least once on basically every repair, and often before and after the work. Extrapolating from these statements and the OEMs’ market share led CCC to conclude that 70 percent of vehicles in its data set should be getting scanned at least once. (The number will likely grow slightly for 2018; Mazda in January issued its own position statement.) And that figure doesn’t even include OEMs like Audi and Ford, who’ve both expressed they want diagnostics done on their cars. Scanning only later-model vehicles might not cut it, particularly since CCC data finds the average repairable car in 2017 to be just 5.9 years old (the 2011-12 model year) and IHS Markit estimated the average car overall was 11.6 years old (2005-06 in 2017) in 2016, the last year for which data was available. Subaru, for example, declares that scans should be done on everything dating back to 2004. Multiple other OEMs said in 2016 that the need to scan can date back to the 1990s, and Honda late last year clarified that it wanted everything dated to 1996 — and potentially some earlier models — scanned. She mentioned results from the “Who Pays for What? surveys done by Collision Advice and CRASH Network. “It’s a higher percentage of people,” Gotsch said. It’s possible that the “Who Pays?” surveys tend to be completed by the nation’s more informed repairers — and the majority of the nation’s 33,500 facilities are closer to CCC’s single-digit rate. It seems like shops who are scanning but not including it on estimates because an insurer or customer won’t pay might want to consider entering the line items anyway with a $0 charge just to get it on the record, even if the shop keeps documentation of the actual scan results as a CYA move. 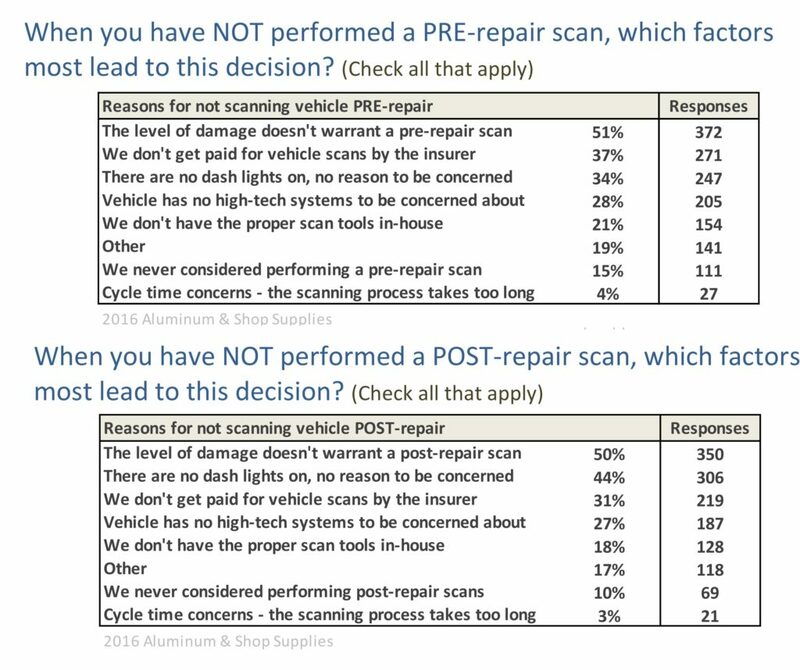 FCA, for example, has said in the past it checks for the presence of scanning procedures on certified shops’ estimates, and a shop estimate could some day be evidence of repairer competency. Obviously, we’re not lawyers, consult with qualified counsel as to what steps are necessary to protect your business. Gotsch said the discrepancy between expected and actual scan rates might also be a function of diagnostics being a not-included procedure, which means the shop or insurer has to manually enter the line item into CCC. (The same goes for counterparts Audatex and Mitchell). Any time an operation is a manual entry rather than a predefined database line item, “there’s a lot of variation” in both the fees charged and how often the work appears on CCC’s library of estimates, according to Gotsch. We asked Gotsch Wednesday about the nature of the $90 scan charge, and if it really meant a shop was charging $180 if it performed a pre- and post-repair scan. The latter, for example, would cover the cost for the popular asTech service, which bills a flat $169 that covers a pre- and post-repair scan. So in some cases there is a separate charge for the Pre and for the post; in others it is combined. The fees range across the board whether it is for just a pre-scan or a post-scan or both – and the same is the case for when a 3rd party company such as Astech is specified. 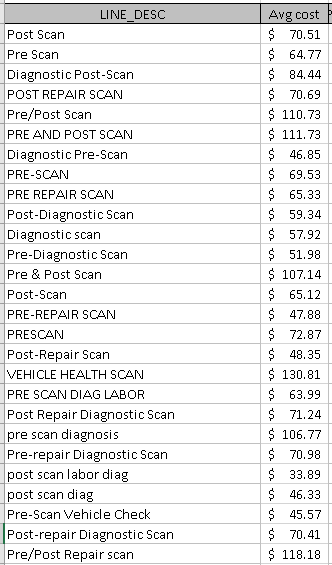 Fees range from as high as nearly $1000 (“Post-Diagnostic Scan +25%”) for some of the luxury models, to $27 (“Post-Diagnostic Scan” or “Pre-Diagnostic Scan”) for some of the mainstream models, so it’s pretty clear there is a wide variation. The range is likely a by-product of who is doing the scan (in-house or outsourced to 3rd party or dealer); and the complexity of the scan. Gotsch said the drop in average charge from $149 to $90 might be attributable to shops just getting better at scanning. 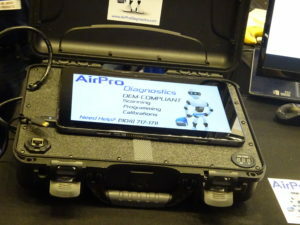 She said some facilities using a remote diagnostic tool (such as the asTech or AirPro) had hired an hourly employee for the grunt work of attaching the scan tool to the car so the remote scanning service could scan and interpret the vehicle’s diagnostic trouble codes. “You don’t need to pay a body tech or a mechanic for that portion of it,” Gotsch said.